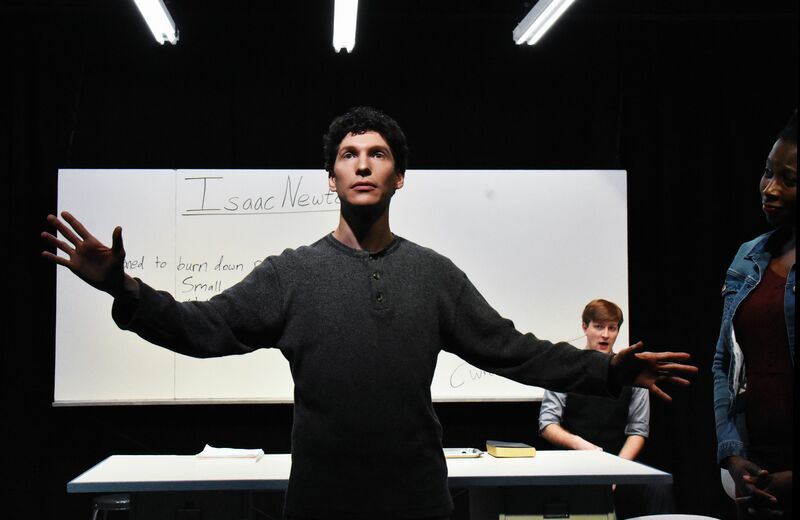 “Isaac’s Eye” Changes the World, at Custom Made Theatre, S.F. “Isaac’s Eye” by Lucas Hnath is a wonder. You have to admire and love the Narrator/Actor (a sly Adam Niemann) who draws us into Newton’s life story. 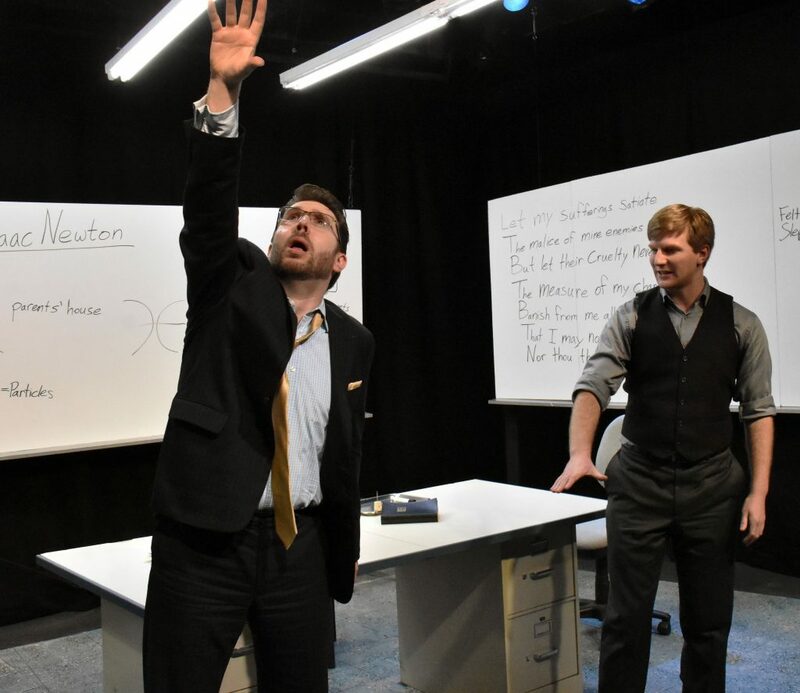 As Narrator, Niemann writes only the true facts of Newton’s life and work on the whiteboards that surround three sides of the stage—all through the show—making it a Brechtean historical spectacle. The Narrator explains what is not true in the story, directly—breaking the fourth wall and making humor out of Newton’s pain. As presented by Custom Made Theatre and directed by Oren Stevens, Hnath presents Issac Newton as a young man (an intense and focused Gabriel A. Ross), struggling with his experiments and his isolation in the countryside. In the first act, Newton is adrift, brilliant but uneducated, trying to make a connection with the Royal Society. Hnath, Stevens, and Ross make Newton’s life and his work immediate to a modern audience, bringing up questions of science, notoriety, and love. And with great wit and humor, too. Here’s a play about the discovery of the laws of optics that actually keeps us on the edge of our seats all the way through. I wanted to get right back in, after the intermission. “Isaac’s Eye” truly has two acts. The second act introduces a new chapter, a reversal in the fortunes of young Isaac and his nemesis from the Royal Society, Robert Hooke (a scheming and witty Robin Gabrielli). The brilliant cast makes both science and scientist accessible, Ross’s hair-trigger delivery expresses Newton’s tenacity and terror. Ross makes Newton as real as a feisty Cal undergrad, and even more brilliant. Through the Narrator we find out that the great Issac Newton, discoverer of gravity, was a very small, petite man, who had white hair by the age of 25. Hnath enlightens us with Newton’s Enlightenment story. Newton baits, cajoles, and battles with a much older and far more distinguished scientist from the Royal Society, in the character of Robert Hooke. 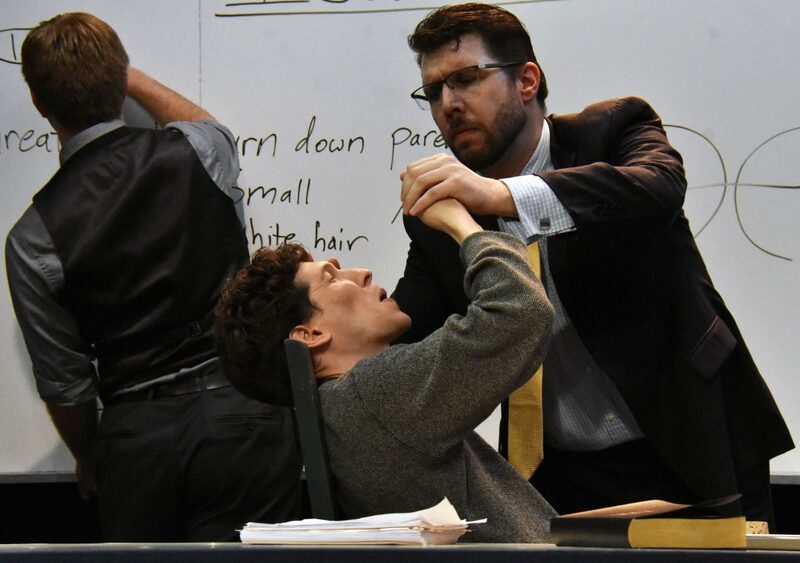 Ross and Gabrielli, in modern dress and in modern American slang, go after one another like an errant son and an authoritarian father—they act like Steven Colbert versus the Trumpster. They bring down the house. And they set the foundations for modern science in the 1600s in England. This feisty Newton has a supposed girl-friend, Catherine (the no-nonsense Jeunee Simon), who offers him love and home-life—but he is so much the scientist that he cannot make that choice. We wonder what is actually holding him back: His abandonment by his mother? His rebellious nature? His disbelief in all institutions—like Steve Jobs? Rebelling against all forms of order and authority—he goddamn still wants to get into that Royal Society! And Robert Hooke could be his pathway to legitimacy. But you know it won’t work. They get into a colossal tussle, debating back and forth. Lying and trickery and trumpery break loose. Their egos run amuck. But you have to love the Newton that Ross creates, and you have to hate the scheming Hooke. You have to love the lovely young woman who tries to help Newton—after all, they do their homework together. I have to see it again! Bravo to Brian Katz and Leah Abrams at Custom Made for another hit! Cast: Adam Niemann, Gabriel A. Ross, Jeunee Simon, and Robin Gabrielli. 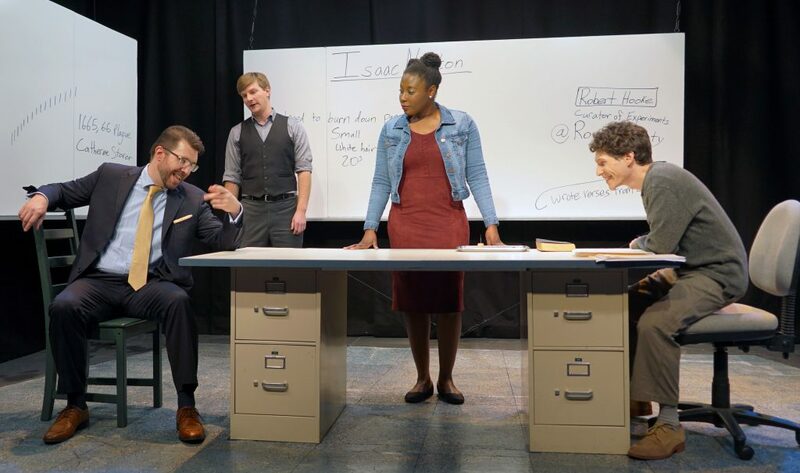 “Four Dogs and a Bone”: Brash & Boisterous at Firescape Theatre, S.F.